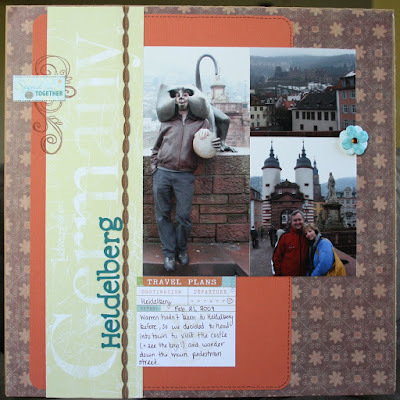 And our Europe album is COMPLETE! Woohoo! 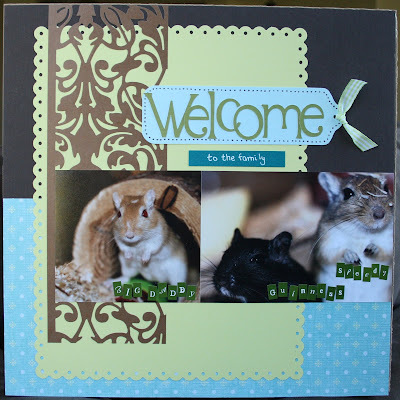 Details: Brown die cut paper is by Sandylion and came in a two paper set. Scalloped edge was made with the Fiskars Threading Water punch. Green letter stickers are by mls. 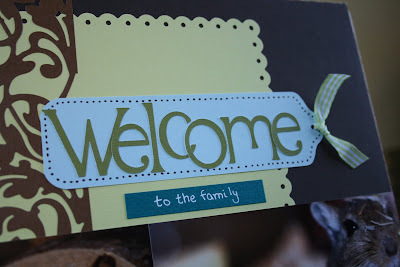 “Welcome” was cut using the Alphalicious Cricut cartridge. 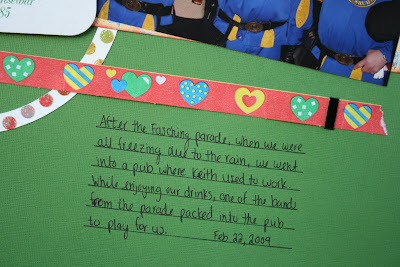 We went to a pub where my brother used to work after the parade. It was so nice to inside and WARM. But then it got reallt loud when one of the bands from the parade decided to join us and play inside the pub. Details: Heart ribbon is actually from my trip. Black bands on the ribbon are Fastenator staples. Yellow/blue star paper is by Basic Grey. Spotted rainbow paper is by DCWV Pet’s Stack. Shield was cut using the Paper Dolls Cricut cartridge. 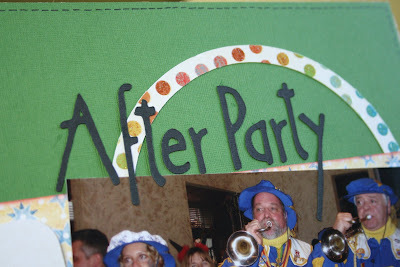 “After Party” was cut using Lyrical Letters (Jack Sprat feature). 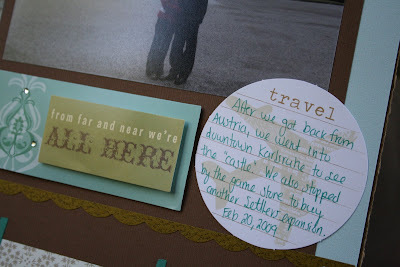 On Friday after getting back from Austria, we went to downtown Karlsruhe to wander and shop. 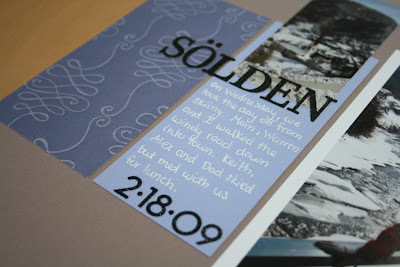 Details: Cream/brown patterned paper is from the SEI Alpine Frost stack. 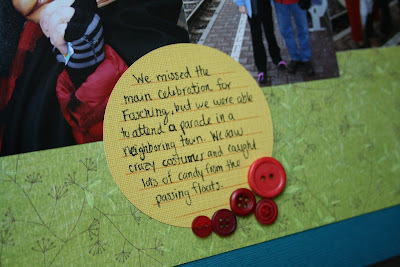 “From far and near we’re all here” embellishment is by Me and My Big Ideas (Soft Spoken). Travel journaling block is by Little Yellow Bicycle. 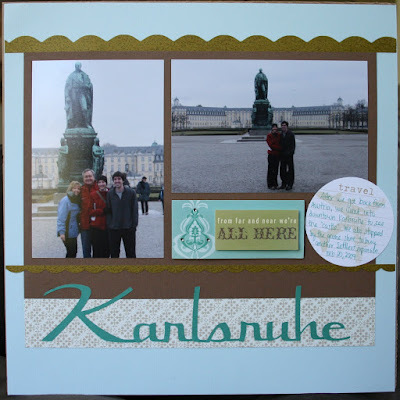 “Karlsruhe” was cut using the Lyrical Letters Cricut cartridge (Connected feature). Details: Green patterned paper that says “Germany” is by Stamping Station. Flower is by K&Company (but I changed the rhinestone color). Travel journaling block is by Little Yellow Bicycle. Ribbon is by Basic Grey. 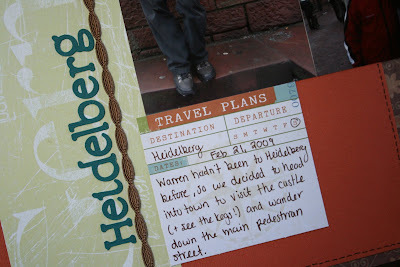 “Heidelberg” was cut using the Lyrical Letters Cricut cartridge (Jumbo feature). 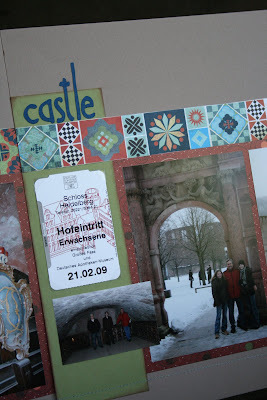 Pictures from the Heidelberg castle. The best parts of this castle are the “small” and large kegs (actually were used for wine). That’s what we’re standing in front of and on top of on the left page. The large keg holds 220,000 litres. Details: Grid patterned paper is by Basic Grey – Dragonwell from the Marrakech collection. Maroon shimmery patterned paper is by Reminisce – Autumn Nights Shimmer. 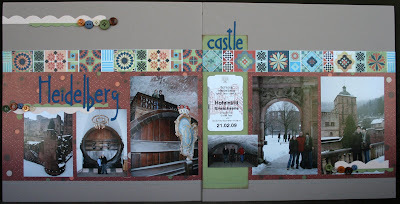 “Heidelberg castle” was cut using the Lyrical Letters Cricut cartridge (Jack Sprat feature). 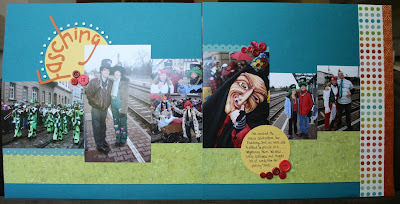 The first Germany layout from our Europe trip. On the last day at my brother’s we went to a Fasching Parade. It’s basically Carnival. You dress up crazy, drink, and catch candy from the passing floats. Details: Spotted paper is from the DCWV Pet Stack. Green patterned paper is by My Mind’s Eye – Penny Lane. Orange ribbon was from the $1 bin at Michael’s. Scalloped edge was made with the Fiskars Threading Water punch. Blue metal dots are by Mark Richards. 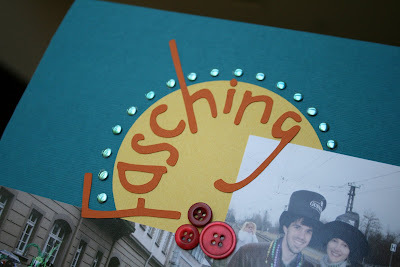 “Fasching” was cut using the Lyrical Letters Cricut cartridge (Jack Sprat feature). 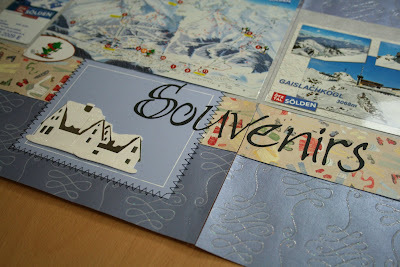 And the Austria layouts are done! Next up: the Germany leg of our Europe 2009 trip. 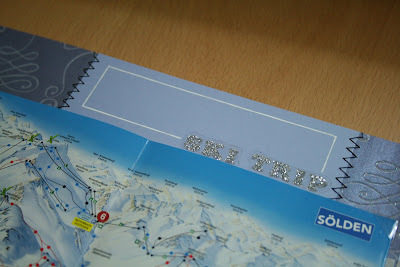 These are some postcards my mom picked up in Soelden along with a map of the ski resort and another ski pass. 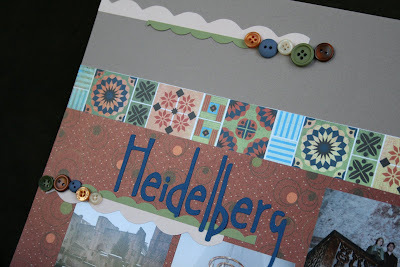 Details: Background patterned paper is by Heidi Grace. Ski clothes paper is from the DCWV Christmas Glitter Stack 2007. House and “Ski Trip” stickers are by Jolee’s Boutique. 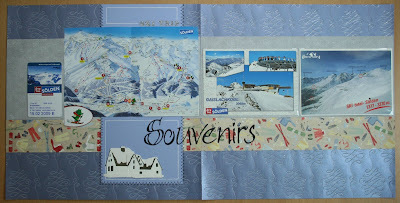 “Souvenirs” was cut using the Calligraphy Cricut cartridge. 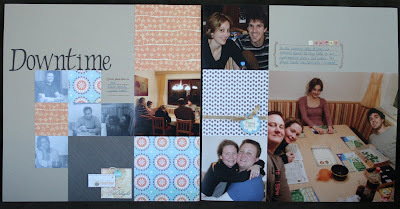 Details: I used scraps, so I only remember some details. Orange patterned paper is by Crate Paper. Dark brown striped paper is by K&Company from their recycled mat stack. “if found please return to” stamp is by Making Memories Passport line. “Downtime” was cut using the Lyrical Letters Cricut cartridge. Here is my mom and I by the river that ran through the town of Soelden. On our day off from skiing we walked down to town for lunch. 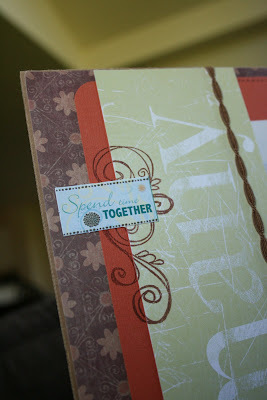 Details: Blue paper with swirls is by Heidi Grace – Vineyard Shimmer. 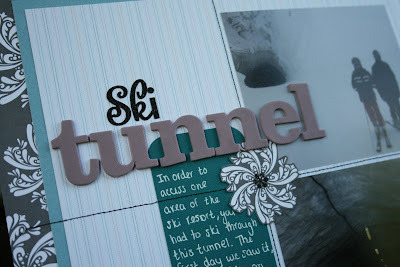 Grey and white swirl was cut out of American Crafts paper (see Ski Tunnel post). Button is also American Crafts. 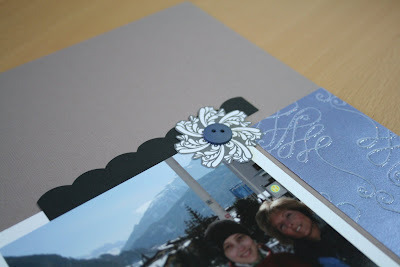 Scalloped line was made using an EK Success corner rounding punch. 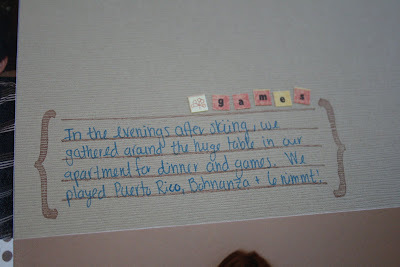 Letters/Numbers are from two different glitter alpha sets by Making Memories. 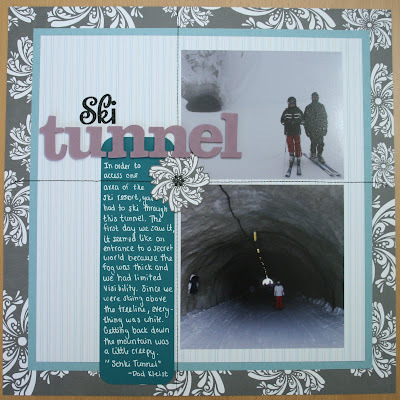 We’d never seen a ski tunnel before and thought this needed to be documented. =) In order to get to one area of the ski resort, you had to pass through this concrete tunnel they bore through the mountain. 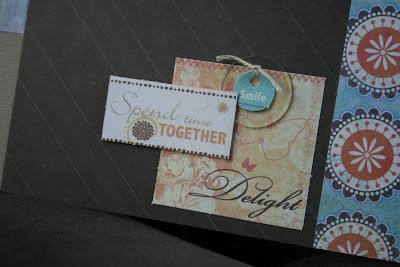 Details: The background grey/white patterned paper is by American Crafts – Modabella Pretty. The striped paper is Heidi Grace – exclusively for Archiver’s. 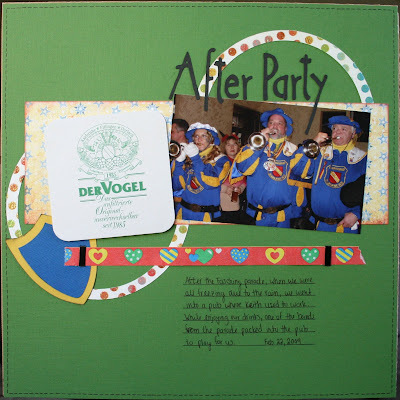 The embellishment in the center was cut out of the background paper (center) before glueing the papers together. Stitching was done on my regular sewing machine. “Ski” was written with Making Memories glitter alphas. “Tunnel” was written with American Crafts Thickers foam alphas.